• Provide more opportunities to recruit certified coaches. It is the start of the season and time to lay the foundations for the year. At this time of the year it is a good time focus on developing basic judo skills in tachi-waza and ne-waza. Important: Fitness and safety are key during the return to judo. Many of the athletes returning from the break might not have good fitness so it might be a good idea to spend the first two to three weeks doing fitness training, practicing ne-waza skills, practicing technical skills and ne-waza randori until your group is ready for large amounts of tachi-waza randori. One of the areas of judo that can be developed in the early season is kuzushi. Having athletes working on their kuzushi is great for their technical excellence, fitness and training their core/back muscles. Every year there are new exciting techniques being introduced into the world of judo but it is important that the top scoring techniques are the core of developing effective judo. Important: Athletes/Coaches should develop methods of blocking or countering top scoring techniques. It is important that athletes that developing competition judo have a killer number one throw to build their judo around. At the 2016 Olympics female matches ended 49% of the time in ippon; male matches ended 60% of the time in ippon. It is important that early in the season we talk to the athletes about trying to open up and score ippon when they do randori. Ippon is still the goal in randori! Good kumi-kata and offensive/attacking judo is the key to effective in randori and competitions. Have fun in the first few weeks of judo when everyone’s energy is at a high level! Note: KOKA KIDS: http://www.kokakids.co.uk/ This is a great reference website for judo clubs designed by Nicola Fairbrother GBR 1993 World Champion and Olympic Medalist 57kg . The website has good material for kids programs, drills, facts, promotion and products for dojos. In this clip Neil Adams explains that all top judoka do not accidentally let things happen in a match. 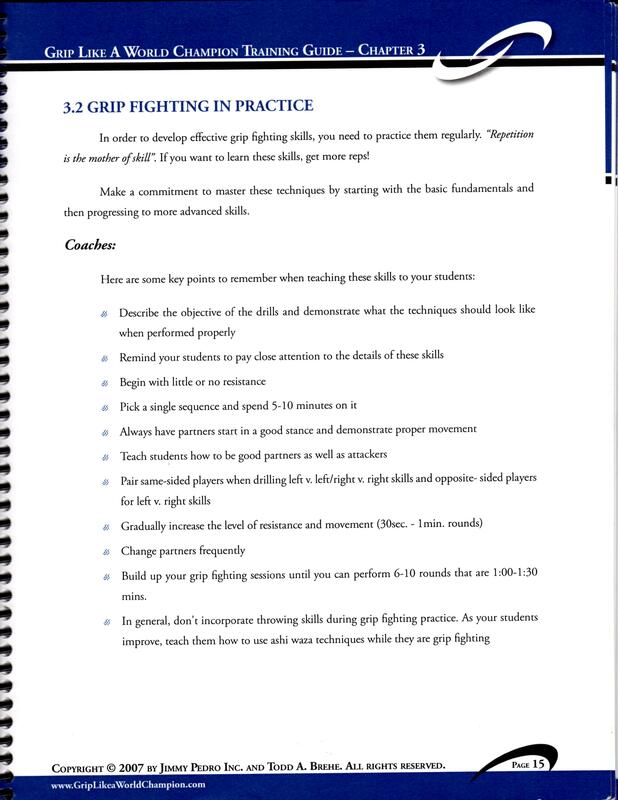 Great judoka take the grip they want and put their opponents in situations where they can successfully execute their best throw and attacking plan. It is important that coaches focus on teaching grip control when their athletes are competing against same side opponents and opposite side opponents. 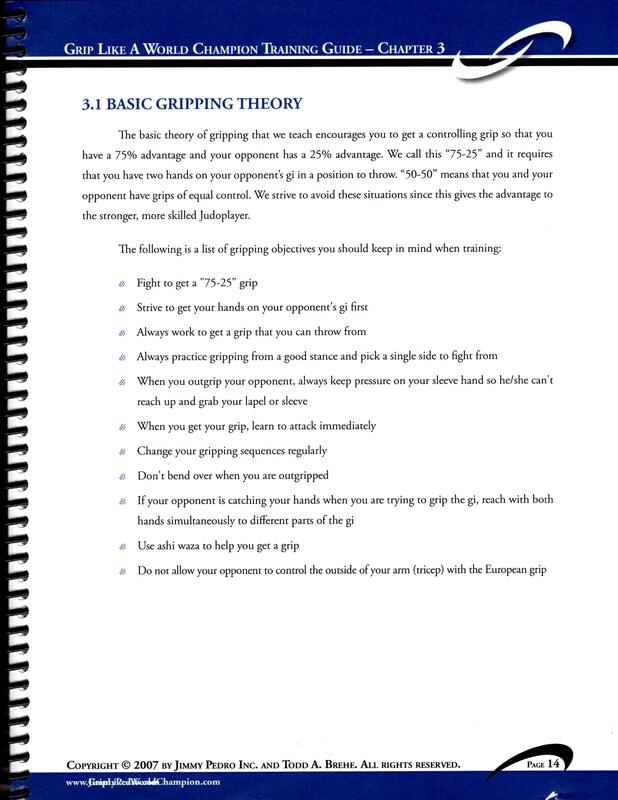 The goal in both situations is the same; have more advantage in gripping than your opponent. Same side situation: Control your opponents sleeve first; then put the second hand on the lapel or on the back. In this clip Neil Adams has a great point about blocking and putting your opponent into better position before continuing with the transition. The first part of the technique (the catch) is often the most critical and the most lazily practiced by athletes. It is important that coaches have the athletes focus on the details and intensity needed to make the technique clean and effective. Please find attached a stat break down for Antoine Valios-Fortier’s development into a world class athlete. I think this is important for coaches to look at because it gives you an idea of what you athletes will achieve to be on the podium at the Worlds/Olympics. The winning percentage represents international matches. Note: These stats can be translated to the Judo Alberta world when you are looking going from the provincial level to the national level. It is important that athletes compete often and have a good winning percentage. Remember: Get your athlete long list in for the 2017 Open Nationals!